Customers Rush To Retail Store In Connecticut To Buy Obamacare : Shots - Health News Connecticut opened retail stores to market its health insurance exchange. Some customers are getting insurance for the first time and others are hoping to lower their premiums. A man leaves Access Health CT's insurance store in New Britain, Conn.
Mike Dunn stands inside a store in downtown New Haven, looking through the big glass windows at his future customers outside. He's not selling phones or food or clothes. He's selling Obamacare. There's one week left to get health insurance through the Affordable Care Act marketplaces, and states have gone to great lengths to enroll as many people up as possible. In Connecticut, the exchange has opened two retail storefronts where people can walk in and sign up. "So, it's just about 10 o'clock when we open up, and we're just starting to see lines forming for people coming in as soon as we open," he says. That's become normal, he says, as the March 31 deadline for enrolling in Obamacare approaches. 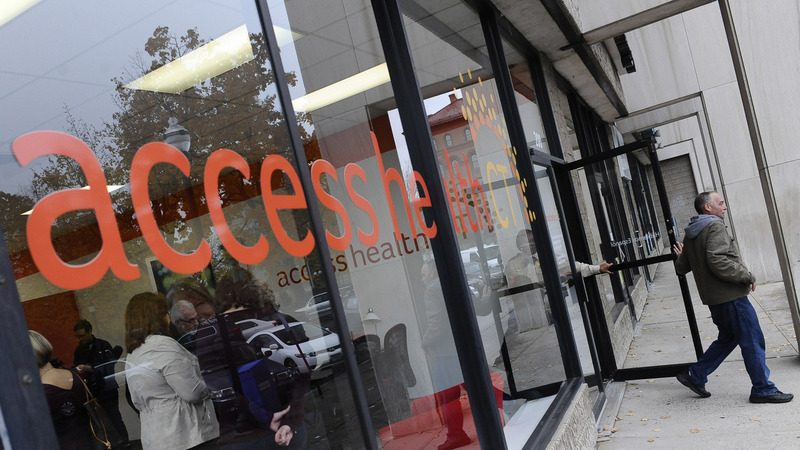 With just days to go, Connecticut's exchange, Access Health CT, has done a better job than most states at enrolling people who are eligible. Strategies like opening a retail store like this one may have played a role in that. A few dozen people have come to check out their health insurance options. Debra White, 63, pays $300 a month to cover herself and her husband. That's about a quarter of her monthly income. She can manage. But it's not easy. "I do have insurance, but I'm coming to see if I can lower the payment because I'm on a fixed income," she explains. Many say what drew them in was the idea of signing up for insurance in person — not on the phone, not on the computer, nor the smartphone. "It makes it easier for me to converse with another person," White says. "When I'm on the computer and everything, it's confusing. Frustrating. Especially this time. I had a stroke, so at this time in my life it's a little difficult." White is here with her grandson, Robert Taylor, 21. He works retail part time, and he goes to community college. He doesn't have insurance at all and he's here to get it. "I'm healthy and I really don't make too many trips to the doctors," he says. "It's just, when I do, I'd like to have a different way of paying for it other than coming out of my pocket." Michelle Perez is next in line for someone who speaks Spanish. She says she's here to figure out if the new health insurance law can help her save some money. She's holding a medical bill for a recent doctor's visit. Because of the state's Medicaid rules, she says she has to pay. She's diabetic and unemployed. And she's here so someone can explain her options to her. 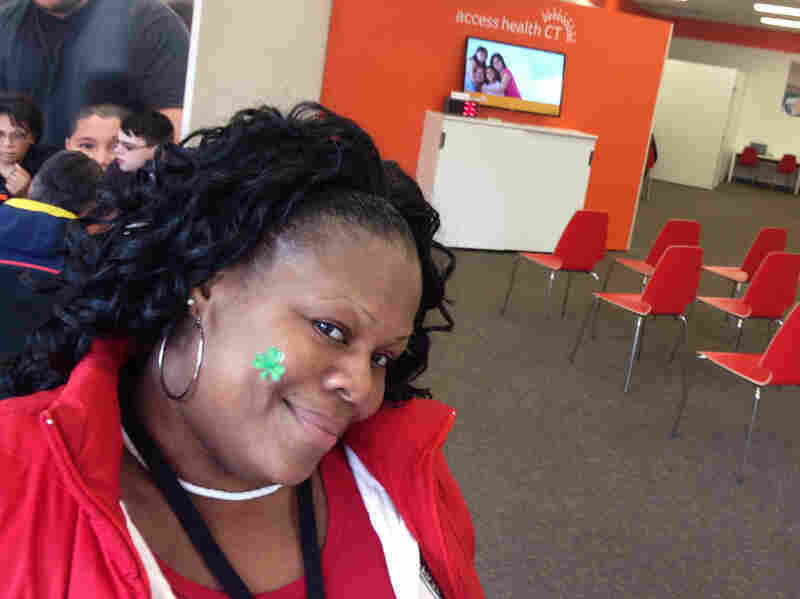 DeLisa Tolson signed up for health insurance at a retail store set up by Connecticut's exchange. She says she was so happy with the experience, she told all her friends. Also waiting for a broker is DeLisa Tolson. She lost her insurance when she got divorced three years ago. Since then, she's gone to the emergency room and to mobile health vans for care. "Even though they did a lot for me on the medical van, there were just some things they just couldn't do," she says. "And so, as far as mammograms and Pap smears, and being over 40, I decided it was time that I came down here and got Access Health." That was three weeks ago. Starting April 1, she'll pay $86 a month for her insurance. That's a lot better than the roughly $240 a month she had priced before. Today she's back, bringing a friend in to enroll. "I came home and I explained to all of my friends how easy it was and how comfortable it was," Tolson says. "It didn't take long at all, either. I was in-and-out within like 45 minutes to an hour. I felt very welcome. It was a very warm environment. It was nice." The state's health care exchange says that Tolson is one of 10,000 people to have walked into one of its two retail stores — and that she's one of 5,000 to have actually enrolled.